Singapore's third desalination plant opened officially yesterday, with the promise of turning sea water into drinking water more productively and cheaply. 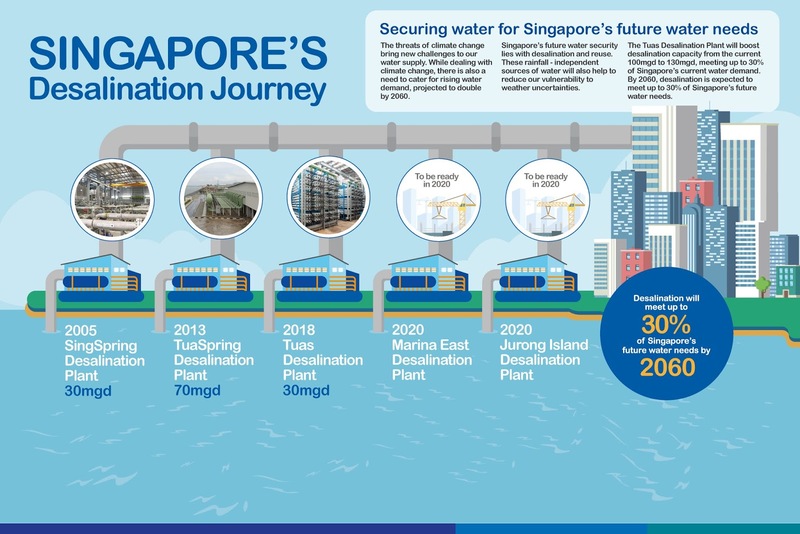 The $217 million Tuas Desalination Plant can produce up to 30 million gallons a day (mgd), enough for 200,000 of Singapore's 1.3 million households. This is as much as the volume produced by the SingSpring Desalination Plant, despite being half its size at 3.5ha. With the new plant, 30 per cent of Singapore's water needs can be met by desalination, up from 25 per cent. Two more such plants are in the works in Marina East and on Jurong Island, and when these 30mgd plants are up by 2020, they will bring total desalination capacity to 190mgd. With Singapore's water use set to double to 860mgd by 2060, such "heavy, but necessary investments" must be made ahead of time and demand, said Minister for the Environment and Water Resources Masagos Zulkifli. "We have seen in other cities the dire consequences of not planning for the long term," he added, highlighting recent water crises in Cape Town in South Africa and Sao Paolo in Brazil. Such investment "is made possible by right-pricing water to reflect the long-run marginal cost of producing our next drop of water, which is likely to come from Newater and desalination", he said. Newater is recycled from sewage. He said he was heartened that per capita consumption of water had fallen from 148 litres a day in 2016 to 143 litres last year. At the same time, Mr Masagos pointed out that desalination is an energy-intensive process, and "if we continue as business as usual, Singapore's desalination energy usage will be four times (that) of today". "We do not want to become energy-reliant in our quest to overcome water scarcity." The technology being tested at the new plant could potentially halve the energy used for desalination, he said. More than 7,000 sq m of the plant's roof will be covered by a photovoltaic system and, when online, the solar panels can generate 1.4 million kilowatt hours of energy a year, enough to power more than 300 four-room flats for the same period. The energy will be used to run the plant's administrative building. The plant is the first to be owned and operated by national water agency PUB, with SingSpring and Tuaspring both run by water-treatment company Hyflux - which has been seeking to sell the loss-making Tuaspring plant. When asked, PUB water supply (plants) director Bernard Koh said PUB's decision to run this plant was not triggered by any private sector lapses. The new plant's opening comes soon after Malaysian Prime Minister Mahathir Mohamad recently criticised the water supply deal between Singapore and his country. Under the 1962 agreement, which expires in 2061, Singapore can draw up to 250mgd of raw water from the Johor River daily at 3 sen per thousand gallons. In return, Johor is entitled to a daily supply of treated water of up to 2 per cent, or 5mgd, of the water supplied to Singapore. Asked if Tun Dr Mahathir's stance made Singapore's quest for water self-sufficiency more pressing, Lee Kuan Yew School of Public Policy's Dr Cecilia Tortajada noted that the new desalination plant was planned years ago. The senior research fellow from the school's Institute of Water Policy added that PUB has always taken a long-term view of Singapore's water challenges. She said water security has been a longstanding priority for Singapore. "Johor is a very important source of water, but so are Newater, desalination and local catchments, and PUB has been working on all of them." Madam Sulami Hassan retired as a gardener two years ago after suffering a stroke, and now lives with her daughter. 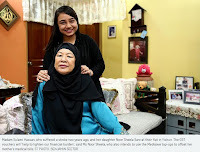 Looking after her 71-year-old mother has been tough emotionally and financially for Ms Noor Sheela Sani, who supports both of them by working as a school administration clerk. 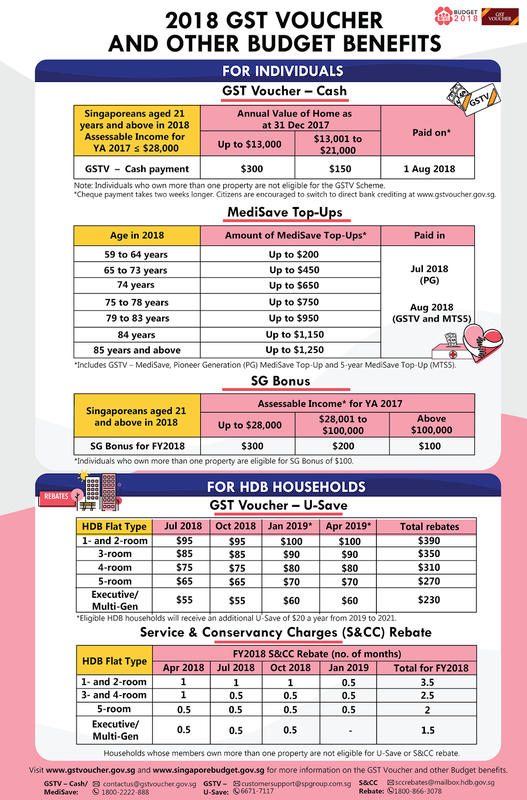 However, Madam Sulami is one of 1.6 million Singaporeans set to receive goods and services tax (GST) benefits and Medisave top-ups - worth a total of $1 billion - which were announced yesterday by the Ministry of Finance. 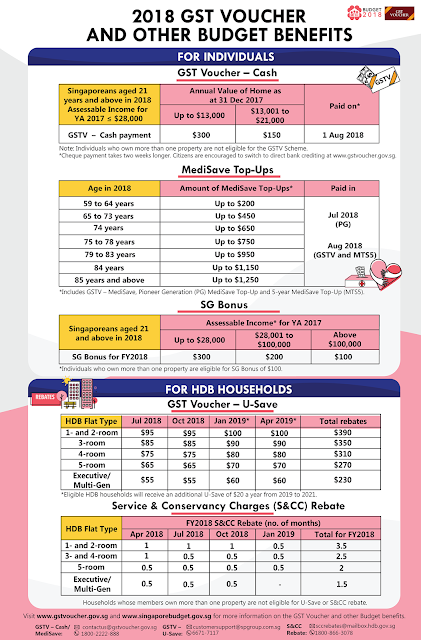 Eligible Singaporeans will receive text messages or letters by July 6 to tell them what they are due to receive under the GST Voucher (GSTV) scheme, which was introduced in 2012 to help lower-and middle-income Singaporeans offset some of their GST expenses. The criteria for eligible Singaporeans include age and annual home value. As announced in Budget 2018, a one-off SG Bonus of up to $300 will be given at the end of the year to Singaporeans aged 21 and above in 2018. A one-off service and conservancy charges rebate will also be given to provide additional support to households. 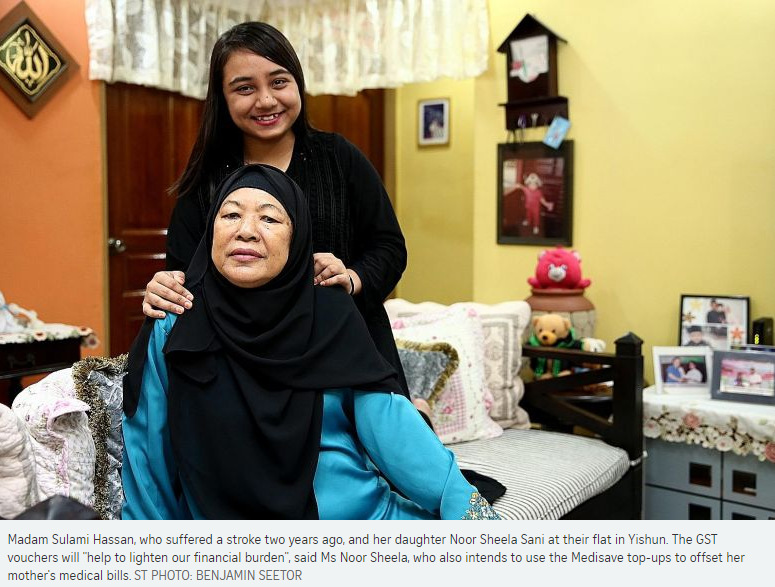 The money will come as a timely boost for Ms Noor Sheela. "When my mother had a stroke, it was really hard for me," said the 24-year-old. "We didn't have the money to afford medical bills and stuff like that. The GST vouchers will really help to lighten our financial burden. I am very thankful. The money will be saved to be used during an emergency. "The Medisave top-ups will also be used to offset some of the medical bills as my mother has to take a lot of medication for diabetes, high blood pressure, cholesterol and more." When I was an undergraduate in social work three decades ago, I learnt that welfare to the poor is a temporary safety net: it is to help individuals "get back on their feet". This lesson resonated with me. Growing up, my family diet was often rice and soya sauce. Clothes and books were handed down from older to younger siblings. My bed was a straw mat in the corridor, because our one-room rental flat was too small for all of us. Like many families back then, we struggled. But my father, a blue-collar worker who raised nine children, taught me the values of self-reliance, hard work and family support. "There is no shortcut to success - just work hard," he would remind us. My experience was not unique. Many of my contemporaries, now well-established in their careers, grew up in similarly challenging situations. 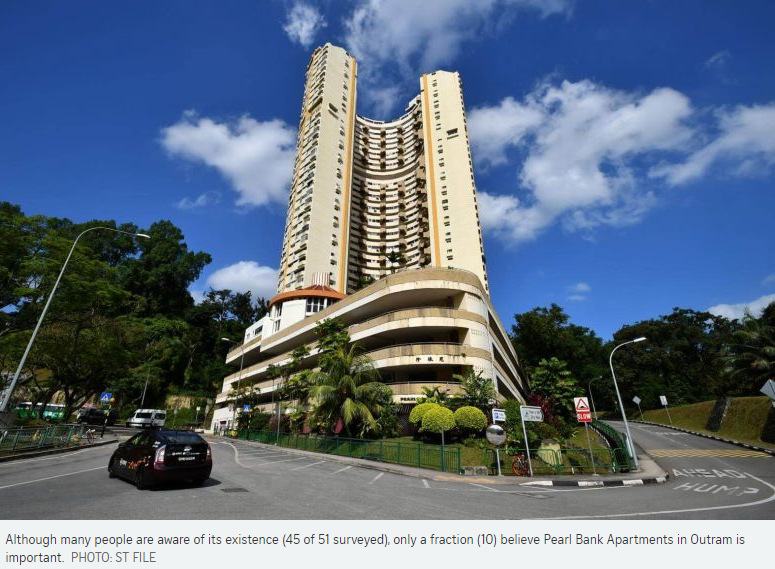 For example, Professor David Chan of Singapore Management University lived in a rental one-room HDB flat in Bukit Merah with his parents and three siblings for the first 30 years of his life. He had to work full-time for several years to save up to pay for his subsequent university education. Many of us grew up experiencing many years of being poor, but we also went through the journey of improving our lives with determination and hard work. So we can see things from the perspective of those who are not well-off, and also know it is possible to improve one's life in Singapore. This became even clearer to me after I graduated as a social worker and later became a Member of Parliament, as I worked almost daily with families in need of different kinds of help. But times have changed, and there is a real difference between my growing-up years and now. Today, families in rental flats receive much more help. Financial assistance, food rations, spring cleaning and home painting, changing to energy-saving light bulbs, free tuition for their children, and many other kinds of help are readily available and regularly offered by organisations and individuals alike. Despite the extensive help extended, some commentators claim that the poor in Singapore, especially those living in rental flats, have severe unmet needs, and are being neglected. They say the poor are struggling because help often comes with onerous conditions; that parents do not go to work because they cannot find suitable childcare arrangements, and that they do not qualify for childcare subsidies because they are not working. But the facts disprove these claims. There are extensive healthcare and childcare subsidies available to mothers in low-income households, including those who are not working. Low-income households are entitled to subsidies and can pay as little as $5 a month for full-day childcare service. This low monthly fee makes childcare services entirely affordable even for the poorest, provided the parents are willing to make adjustments and take up full-time jobs, like many other low-income parents in Singapore. Taxpayers' money should not just be given away, even to the needy, without expecting the recipients to help themselves. Social workers working with low-income households on a daily basis (sometimes for many years) have a good understanding of the difficulties they face, and the challenges in helping them. 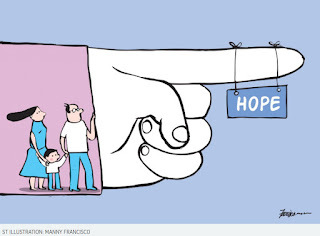 Many have learnt that imposing certain conditions on the families receiving subsidies does help them structure their lives, a necessary first step in progressing towards a better life. The relevant point here is this: In making conclusions about the poor in Singapore, we need to be careful about using some particular cases or groups to generalise about the poor, the system, and the outcomes. We need to look at the facts and understand the situations. We should also draw lessons from the many inspiring households who got back on their feet because they took ownership of their problems, worked hard, and made good use of the help they received. So what is really going on regarding helping low-income families living in rental flats? Let me illustrate with a real-life project we undertook over several years. Singapore has reiterated that both Malaysia and the Republic have to adhere fully to the 1962 water agreement, after Malaysian Prime Minister Mahathir Mohamad yesterday criticised the price of raw water sold to Singapore as "ridiculous", and said he planned to renegotiate the pact's terms. In a statement yesterday, a Ministry of Foreign Affairs (MFA) spokesman said that the 1962 treaty was guaranteed by both governments in the Separation Agreement, which was registered with the United Nations when Singapore broke away from Malaysia in 1965. "Both sides must comply fully with all the provisions of these agreements," the spokesman said. In separate interviews with Channel NewsAsia (CNA) and Bloomberg Television, Tun Dr Mahathir revived the water price issue which was a recurring source of tension between both countries, especially during the later half of his previous term as prime minister from 1981 to 2003. He told CNA that the price - 3 sen per thousand gallons - is "ridiculous", and that Malaysia will approach Singapore on renegotiating the terms of the deal. Asked if he will talk to Singapore about going back to the drawing board on the issue, Dr Mahathir said: "We are studying the case properly and we will make a presentation." However, he said it is "not urgent" during a news conference yesterday after a Parti Pribumi Bersatu Malaysia supreme council meeting. On whether the Cabinet discussed the matter before his media interviews, he replied: "We didn't discuss the water issue. But I was asked by the press." The water agreement, which expires in 2061, entitles Singapore to draw up to 250 million gallons a day (mgd) of raw water from the Johor River daily. In return, Johor is entitled to a daily supply of treated water of up to 2 per cent or 5 mgd of the water supplied to Singapore. Singapore pays 3 sen per thousand gallons of raw water, and sells treated water back to Johor at 50 sen per thousand gallons. In his interview with Bloomberg published yesterday, Dr Mahathir criticised the 1962 water supply deal with Singapore as "too costly", and said it is among the issues with Singapore "that we need to settle". This follows on his announcement last month that Malaysia plans to scrap a multi-billion-dollar high-speed rail (HSR) line from Kuala Lumpur to Jurong East. He has yet to inform Singapore about its intent, he confirmed during the CNA interview. In an earlier interview with The Straits Times in March, before he won the election last month and became prime minister for a second time, Dr Mahathir described the price of the water sold to Singapore as "absurd". The legally binding 1962 treaty contains provisions that make clear Malaysia cannot unilaterally raise the water price any time it wants. A veteran diplomat who declined to be named told The Straits Times Dr Mahathir is reviving the water price issue now as he has never accepted the terms of the 1962 pact. The 1961 and 1962 water agreements provided for a price review after 25 years - in 1986 and 1987, respectively. Malaysia chose not to review the price then, MFA said in an article on its website on the issue. But Singapore allowed for a renegotiation of the issue when Dr Mahathir later raised it in 1998. Over the span of four years, both countries underwent several rounds of talks on water and other bilateral issues as part of a package. Malaysia continually raised its asking price for water, and the matter became a sore point in relations. 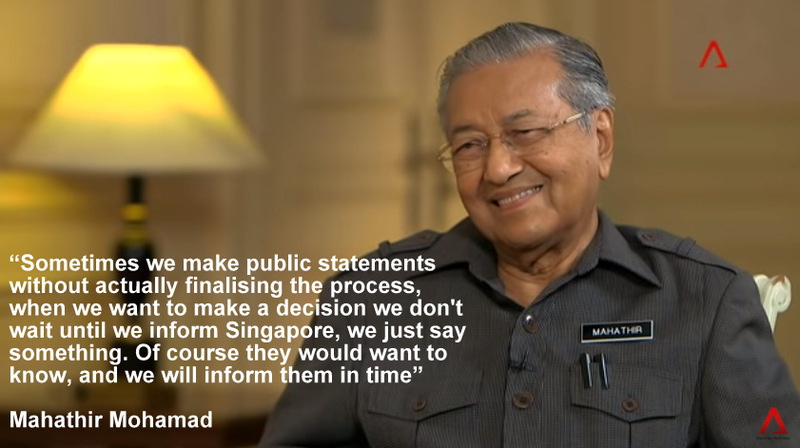 In October 2002, Dr Mahathir decided to abandon the process. In January 2003, then Foreign Minister S. Jayakumar made public all correspondence on the matter, and the Government released a booklet, Water Talks, to debunk Malaysia's claims. 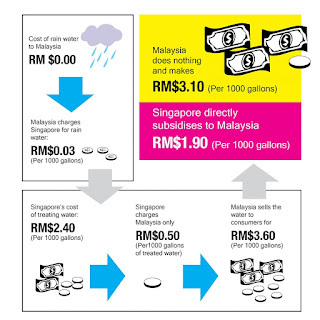 In it, the Government said that it costs Singapore RM2.40 to treat every thousand gallons of water. 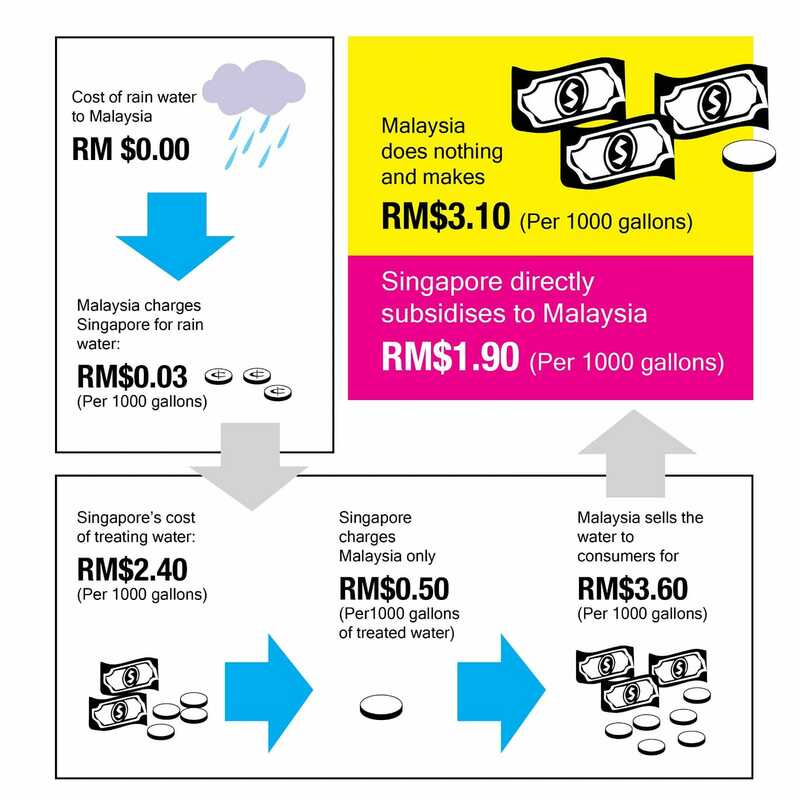 By selling at 50 sen, Singapore is providing a subsidy of RM1.90 per thousand gallons of water. "His intention is to make the Singapore Government look unreasonable hoping, first, that Singaporeans will pressure our government on his behalf, and, second, to set up an alibi with his own people," he said. "All this is out of Dr M's standard playbook. Singaporeans should not be deceived. Good neighbourliness ought to be a two-way street." It also said Johor sold the treated water to Johoreans at RM3.95 per thousand gallons, which amounts to RM46 million in profits a year. All in, Singapore has paid over $1 billion on various water treatment infrastructure, including building a dam to create the Linggiu Reservoir that increases the yield of the Johor River, said the Government. In a Facebook post yesterday, diplomat Bilahari Kausikan said Malaysia buys "considerably more" treated water from Singapore than it is entitled to under the terms of the agreement. "Why should it do that unless it is getting a good deal?" he wrote. In a written parliamentary reply last year, Foreign Minister Vivian Balakrishnan said Singapore has been regularly supplying Johor with 16 mgd of treated water - in excess of its entitlement. Mr Kausikan said he believes Dr Mahathir is now raising the water issue "only as a diversionary tactic" in preparation to ask for a waiver or reduction of the compensation Malaysia has to pay Singapore if it formally cancels the HSR project. Why the poor are poor: $500 a month on cable TV and cigarettes and this family still wants financial aid? What should social workers do with a family that spends $500 on cigarettes and cable TV, yet applies for financial aid? Questioning the poor on their needs and choices is part of helping them. 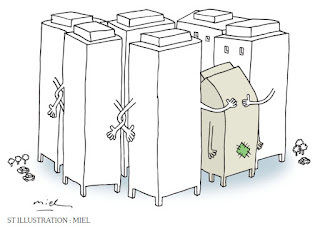 In a recent article, sociologist Teo You Yenn painted a bleak picture of the conditions rental flat dwellers live in (Let's talk about meeting needs, not just equality of opportunity; ST May 30). She argued, among other things, that insufficient space can lead to children being open to negative influence and that the process of getting help can cause families living in rental flats to lose their dignity because they are often asked demeaning questions. As a practising social worker of 32 years, I started my career working with disadvantaged families. In the last five years, my team of social workers and I have worked at the Housing Board's Bedok Interim Rental Housing (IRH) project, also called P4650 after the two blocks the families lived in. These are our experiences with them. The residents of P4650 comprised three groups: families waiting for a rental flat; families in financial straits and downgrading to smaller flats which were still being built; and families ineligible for public rental flats but unable to afford their own housing. Many of these families were overwhelmed and left with little family support, having exhausted the goodwill of relatives and friends. Some were living on the beach or in parks before arriving at the IRH. Most were previous home owners who had sold their flats for various reasons, spent the proceeds, and then became homeless. We had the daunting task of getting these families permanent housing. At least a quarter of the families had deep-rooted, multiple problems such as untreated medical and mental illness, addictions, entrenched financial problems, incarceration and severe family conflicts. We tried to help these families prioritise their most pressing problems before working on their housing goals. Another challenge was a group of families who only wanted tangible aid - financial help, food rations, rental and utility vouchers. Put bluntly, they were saying to us: "Just give us what we want and leave us alone." They resisted discussing their problems. A few became angry and abusive when social workers suggested meetings. It was difficult, but we persevered because these families needed help, too. At P4650, we learnt the complexities these families presented - lessons that caution against painting a simplistic picture of rental flat dwellers with a broad brush. Let me share some of our takeaways. All parents have dreams for their children. Yet, many disadvantaged families feel that having such dreams is beyond them. Some stay angry and disappointed with their lot in life. We found that getting parents to express their hopes and vision for their families was critical in bringing about change. For some, it meant saying: "I wish we could have our own flat." For others: "I wish I could afford to send my children for enrichment classes or overseas trips." 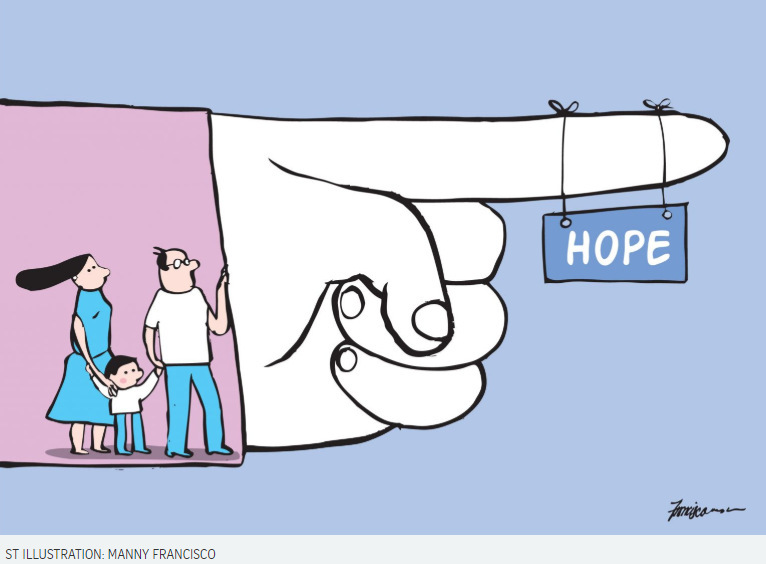 Once a parent articulated such hopes, the social workers could discuss options to make seemingly unattainable dreams come true, working out solutions, and identifying the resources needed. This co-creation of solutions was possible even for the most challenging families. For example, we worked intensively with a jobless and angry mother of three who depended on financial aid and food rations for three years while her husband was in jail. She expressed hope for her children to get a good education. It took some effort to show her that having a job would enable her to buy an HDB flat and provide her children with a more secure environment. She found work, went on to buy a two-room flat, and stopped relying on handouts. After his release from prison, her husband found work, and the family income rose. Then there was a father of five who earned $1,600 a month and refused help because he felt it was his duty to provide for his family. To save expenses, he wanted his oldest son to quit school. The boy, a top student at the Institute of Technical Education, was devastated. We persuaded the father to let his son finish his education, with help to pay the fees. We worked with Workforce Singapore to get the father started on a diploma course which could help him double his income. He agreed to accept temporary financial aid while he finished his diploma. Those efforts paid off, and the family left the IRH to move into their own three-room flat. It was small, but it was theirs. Social workers are sometimes faulted for asking seemingly intrusive questions and for their obsession with genograms and ecomaps (that, respectively, map a person's family and friendship networks) and income and expenditure assessments. Asking good questions and using tools appropriately are in fact relevant and important. They are vital to understanding how families make decisions, and the various roles that family members play. 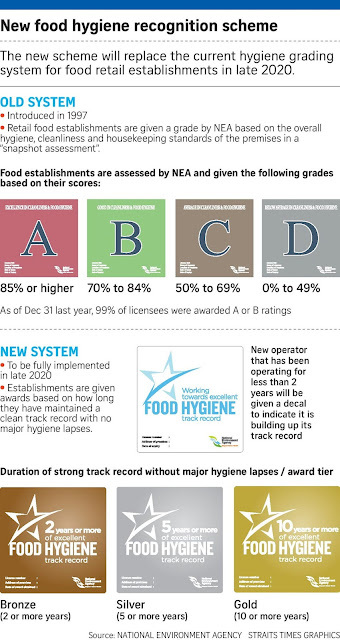 The National Environment Agency (NEA) will replace the existing hygiene grading system for eateries in late 2020, in the first review of its kind in more than 20 years. The new food hygiene recognition scheme will focus on consistency, with establishments awarded bronze, silver and gold ratings based on their track records. Eateries with no major hygiene lapses for two years will get a bronze award, and those with a clean record of five or 10 years will get silver and gold, respectively. Currently, establishments are graded A, B, C or D annually based on a "snapshot assessment" of their premises. This system has been in place since 1997, with 99 per cent of the 36,000 licensees achieving grade A or B at the end of last year, up from 77 per cent in 2006. The NEA said the existing system has become "less useful in helping consumers to distinguish good performers" with almost all licensees being graded A or B. Operators with good grades have also been linked to food hygiene lapses. For new establishments that have been operating for less than two years, a label that states "working towards excellent food hygiene track record" will be displayed. As part of the transition, eateries currently with an A grade can voluntarily apply for the new award from April 1 next year. The new scheme will take full effect from late 2020, to give time for all existing licensees to attain at least a bronze award. Currently, only a third of eateries would receive an award if the system were to be implemented immediately, with only 5 per cent eligible to receive the gold award. The NEA said the new scheme was developed in consultation with industry partners such as the Restaurant Association of Singapore, the Singapore Hotel Association, coffee shop associations and hawker associations. 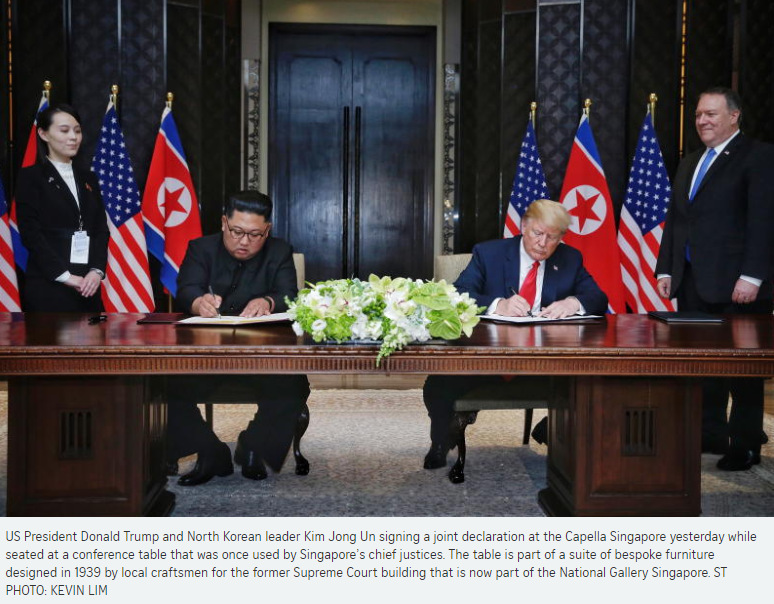 The bill for hosting the historic Trump-Kim summit will come up to about $20 million, said Prime Minister Lee Hsien Loong, adding that this is Singapore's contribution to an international endeavour that is "in our profound interest". "It is a cost we are willing to pay," he said, adding that security costs would account for about half that figure. Speaking to the Singapore media yesterday during a visit to the international media centre, Mr Lee noted that the summit is a very major operation, due to - among other things - its scale, the number of journalists here to cover it and the level of security required. 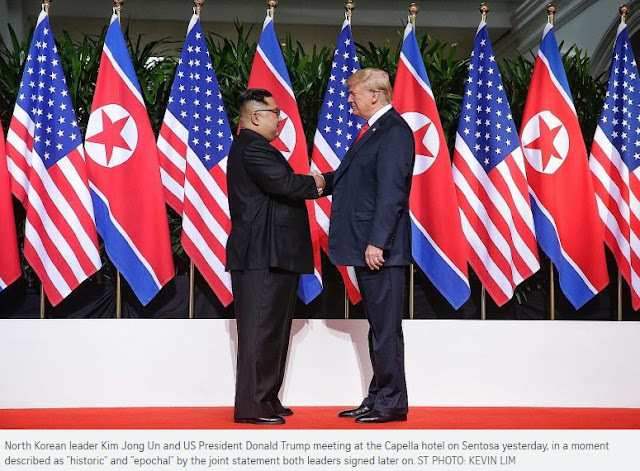 The security requirements are much higher than for previous meetings because of the profile of this summit and the nature of what is being discussed, he added. Delving into some of the details, he said it involves not just cordons of policemen around the meeting venue but "all-round protection and in-depth protection - air, sea, land, against attack and against mishap". "So this is a very major operation, because it's a high-profile meeting and we cannot afford to have anything go wrong." Mr Lee also said Singapore might be able to recoup some of the costs of hosting the summit. Asked to elaborate, he replied: "If you calculate the price of everything in this world, you will miss out on the real important things. And in this case what is important is that the summit is held, and we are hosting it, not extravagantly but with due consideration to costs, but making sure operational requirements are met." Besides the security bill, another substantial part of the costs is from facilitating the 2,500-strong contingent of journalists here. A Ministry of Communications and Information source said that this - including the set-up of the international media centre at the F1 Pit Building - comes in at around $5 million. The $20 million bill for the summit is a fraction of the $150 million spent each year to host past editions of the Formula One race. The issue of cost has, however, raised questions among some Singaporeans, who have also chafed at having to contend with restricted access and road closures. Asked about this, Mr Lee said that what is important to keep in mind is the significance of the summit and also what hosting it successfully could mean for Singapore. It is, he said, not just a whole-of-government effort, but a "whole of Singapore effort", involving people ranging from press officers to bomb disposal unit experts. It also includes ordinary Singaporeans whose lives have been "a little bit inconvenienced because roads have been cordoned off and traffic jams can happen - I hope you will understand this is for a good cause, it is a national effort, and I hope we will all be able to work together to show the world what Singapore can do". Yesterday, Mr Lee also visited Singapore Armed Forces troops deployed at Palawan Kidz City on Sentosa, and the Home Team command post in Novena. "The officers have done a good job under very pressed circumstances," he said, pointing to the short notice given. It was only two weeks ago that it was confirmed the summit was going ahead. 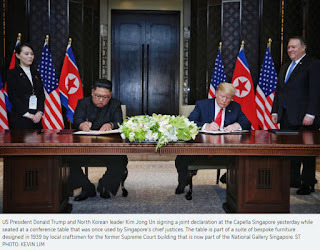 It is not easy to find a suitable location to host such a meeting, observed Mr Lee, as both the Americans and the North Koreans must agree on a venue that meets their requirements and is politically and diplomatically acceptable to them. "Therefore, when the two sides asked us to host the meeting, we cannot say no," he said. "We have to step up... We can do a good job." The summit is a plus for Singapore, in terms of its reputation, its standing and "how people look at us", he added. "It gives us publicity. The fact that we have been chosen as the site of the meeting - we did not ask for it, but we were asked and we agreed - says something about Singapore's relations with the parties, with America, with North Korea, also our standing in the international community." Singapore is one of the few countries that have diplomatic relations with both sides. 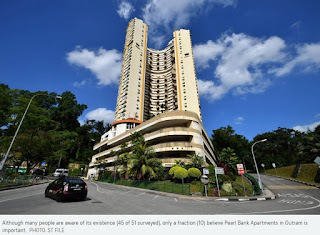 Mr Lee added: "I think people will sit up and say, why is this meeting happening in Singapore, and they will draw their conclusions, and they will see how things are run. And I'm sure that we will be able to show what Singapore can do, so I think it's a plus for Singapore." For at least the fifth year running, Singaporeans feel safer than residents of any other place in the world, a global study has found. Research firm Gallup says 94 per cent of adults here feel safe walking alone at night, compared with the global average of 68 per cent. 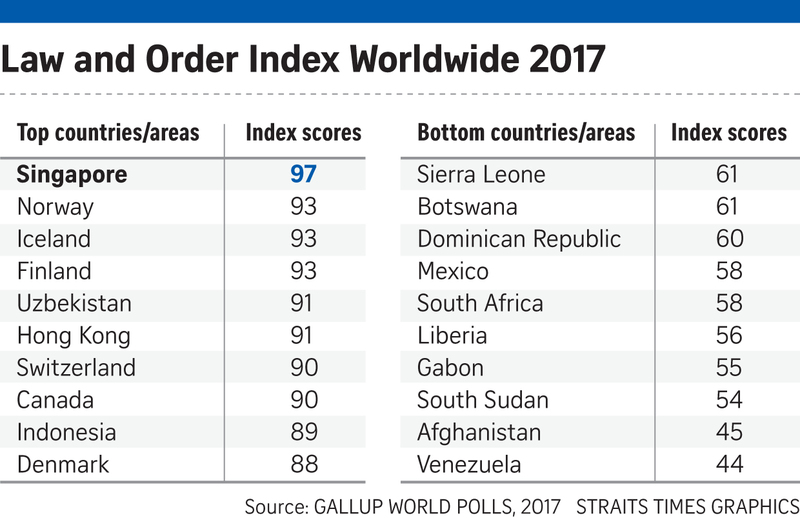 Singapore tops the list in the Law and Order Index, ahead of Norway, Iceland and Finland. Hong Kong and Uzbekistan are joint fifth. The result is consistent with other studies. 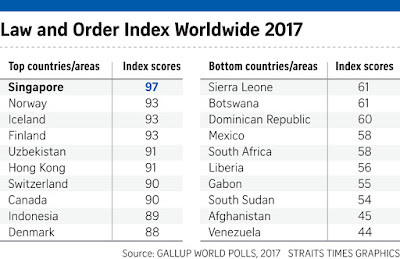 The World Justice Project's Rule of Law Index 2017-2018 ranked Singapore first for order and security. Singapore was ranked the world's safest city in the 2017 Global Smart City Performance Index published this year. The 2018 Global Law and Order Report, released yesterday, interviewed close to 150,000 residents in 142 countries and areas last year. Respondents were also asked about their confidence in the local police, and whether they had been recent victims of crime. Ms Nicole Naurath, Gallup world poll regional director for Asia, said the result was no surprise as "Singapore emphasises safety and security throughout all facets of society as a means to ensure its prosperity". Mr Toby Koh, group managing director of Ademco Security Group, said Singapore's reputation for security is a key reason many global firms set up their headquarters here, adding that "safety and security is paramount to top management". He said that there are also personal considerations - employees bring their families along when they come to work here. Associate Professor Teo You Yenn describes the desire for decent jobs, better housing and other conditions as "basic needs" (Let's talk about meeting needs, not just equality of opportunity; May 30). These needs are absolute not relative. Whether 10 per cent or all of the population have these needs unmet doesn't change the fact that our Government should strive to provide better jobs, better housing and better lives for the people. Inequality does not change this. When Singapore was young and undeveloped, there was less inequality, as many people were equally poor - in fact, it was probably even more urgent for the Government to make sure that basic needs were met, because more people could not meet them. Just because inequality has worsened does not make these priorities any more or less important. It is important to distinguish between absolute poverty and relative poverty when thinking about inequality because it affects the sort of policies we implement. If we believe that absolute poverty should be ameliorated, policies should gear towards some redistribution to ensure that those at the bottom of society get a minimum standard of living. The challenge for all societies is to define what that minimum standard is and how much to redistribute. These disagreements are the reason for divisions in political ideologies and parties. Relative poverty, or inequality, is a lot more complicated. One could, for the sake of a thought experiment, imagine a nation of millionaires where everyone's basic needs are met, but a predominance of billionaires causes income inequality to be very high. In such a scenario, it would be absurd to argue for a redistribution of income to equalise outcomes. However, it does not mean that all is well in such a state. 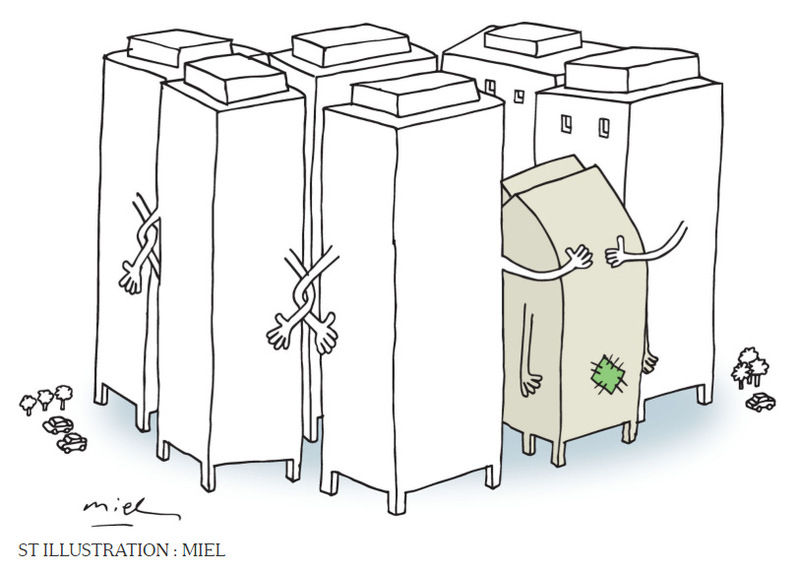 Inequality causes division and stratification in society. In this instance, the right policy will not be redistribution per se, but rather, to reduce stratification. For example, building better houses per se in such an imagined nation will not be as urgent as ensuring that people of all income levels reside in close proximity with one another, and are forced to interact. The priority will not be to equalise outcomes, but to ensure that society remains cohesive. It is, thus, imperative for us to think clearly about inequality and not mistake relative poverty for absolute poverty. Mixing up the two will result in inappropriate policy responses that solve neither problem. A chapter of Singapore's history came closer to an end on Sunday, when one of only two surviving members of the People's Action Party Old Guard leaders died. 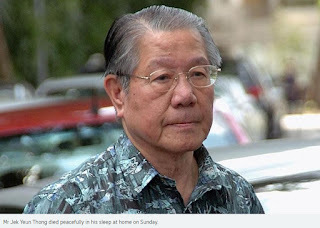 Mr Jek Yeun Thong, 87, died peacefully in his sleep at home, with his family around him, his son Jek Kian Yee, 55, told The Straits Times yesterday. He also said that in accordance with his father's wishes, the family had a private wake and funeral, which was held on Tuesday. As a mark of respect, and in recognition of his contributions to Singapore, the state flag on all government buildings will be flown at half-mast today, June 7, the Prime Minister's Office said yesterday. Mr Jek was among the 10 men who put their names on the Independence of Singapore Agreement on Aug 9, 1965, when Singapore left Malaysia and became independent. The remaining member of the group is former education minister Ong Pang Boon, 89. President Halimah Yacob and Prime Minister Lee Hsien Loong yesterday led the tributes paid to the Mr Jek, who had held ministerial portfolios in labour, culture, and science and technology, as well as served as high commissioner to the United Kingdom and ambassador to Denmark. He made many contributions in his 25 years of public service - from mobilising the Chinese ground to upholding a multi-racial Singapore and advocating a Singaporean identity.